Sable Island, a 44-km-long sand bar about 300 km east south east of Halifax, Nova Scotia, is renowned for its wild horses. For sailors, it was the graveyard of the Atlantic, an island hidden by waves, storms and fog that meant only death and destruction. Since 1583 there have been over 350 recorded shipwrecks on Sable Island. Very little now remains of the ships that were wrecked on the island: a shoe buckle, a few coins, ship name boards, timbers buried in the sand. 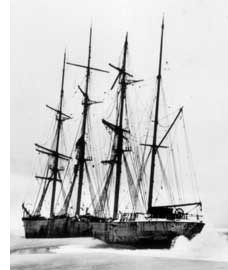 The British barque Crofton Hall stranded in 1898, 3 miles from the east spit in thick fog. All were saved, some with the breeches buoy. MMA, MP 2.211.2, N-16,416. Location: Sable lies near one of the world's richest fishing grounds. It is also near one of the major shipping routes between Europe and North America. Hundreds of vessels sailed past each year. It's a very stormy place: Sable lies right in the path of most storms that track up the Atlantic coast of North America. Storms were extremely treacherous for sailing ships. Vessels were simply blown onto Sable. Fog shrouds the island: in summer warm air from the Gulf Stream produces dense banks of fog when it hits air cooled by the Labrador Current around Sable. Sable has 125 days of fog a year. Toronto has 35. The currents around Sable are tricky: Sable lies near the junction of three major ocean currents, the Gulf Stream, the Labrador Current and the Belle Isle Current. There have been few shipwrecks on Sable since 1947. Prior to then the sextant was the principal instrument used to fix a ship's position. Sextants were accurate, but they worked by taking a sighting from the sun or the stars. They were useless in dense fog or cloudy skies. In bad weather, the captain navigated by "ded. reckoning", using the ship's speed and direction to estimate his position. But even in good conditions this was educated guessing. Currents and storms confused the calculations of the best skippers. Many accounts of shipwrecks report that the captain simply lost his way: he misjudged his ship's position and bumped into Sable Island by mistake. After World War II radar and other advanced navigational equipment became widely used on commercial vessels. Sable ceased to be a major threat to shipping. Only one vessal has been lost since 1947, the small yacht Merrimac which sank on July 27, 1999. 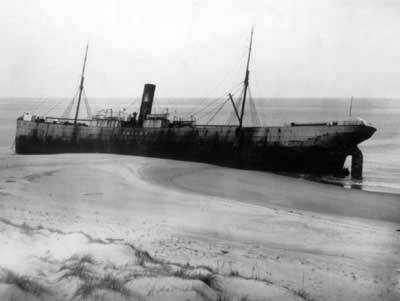 British steamer Skidby, wrecked in 1905, is still visible. Her crew walked ashore at low tide. MMA, MP 221.57, N-16037. Public concern about the fate of shipwreck victims on Sable Island led to the first lifesaving station in 1801. This "Humane Establishment" was active on the island until 1958. Many shipwreck victims owed their lives to the skill and courage of the lifesaving crew. They were ordinary folk, doing a tough job on an island that was sometimes very beautiful, but more often cold, damp and uncomfortable. They were remarkably successful at saving lives. Before the Humane Establishment, wreckers salvaged the island's shipwrecks. Rumours of ships deliberately lured onto the sand and passengers murdered helped lead to government action. Lighthouses: The East and West Lights were first built in 1873. As the island eroded, the West Light was moved in 1883, 1888, 1917,and 1951. Keeping the light shining meant having a lighthouse keeper awake to watch it during all the hours of darkness.The light, the lens and the rest of the mechanism all needed tending. Houses of Refuge: These shelters for shipwreck survivors were scattered along the island. Inside, the cold, wet survivor found firewood, food (suspended beyound the reach of rats) and directions to the nearest lifesaving station. Lifesaving Stations: The lifesaving communities were Sable's first permanant settlements. A steamer brought supplies a few times each year, but mostly the men and their families made do with what the island provided. The entire coast could not be patrolled from a single station, so by 1895 there were 5 stations along the island's 44 km length. The Main Station had a Sailor's Home where shipwreck survivors could wait for the next steamer to Halifax. The lifesaving crew's work included maintaining buildings and equipment, picking cranberries to help finance the operation and hunting ducks and seals for fresh meat, as well as lifesaving drills and actual rescues. The Humane Establishment ended in 1958, after 11 years without a shipwreck. Now, the lighthouses are automatic, the Main Station in ruins. Sable's only year-round residents are half a dozen weather observers, sometimes with their families. 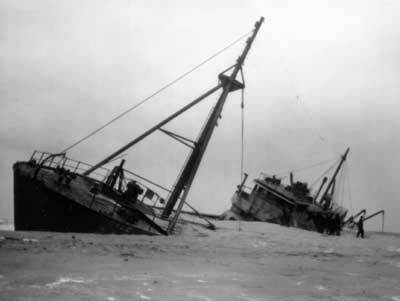 The aptly named trawler Gale is swallowed by sand after running aground in 1945. MMA, MP 15.49.3, N-16176r.